“What did you guys do for fun when you weren’t working?” I ask the guy. Hoots and giggles fill the Bathhouse at Hanging Rock State Park, where one Dr. Harley Jolley is just about done regaling us with tales of life in the Civilian Conservation Corps, which sent him to Yellowstone during the Great Depression and built the stone structure we’re sitting in for his presentation. 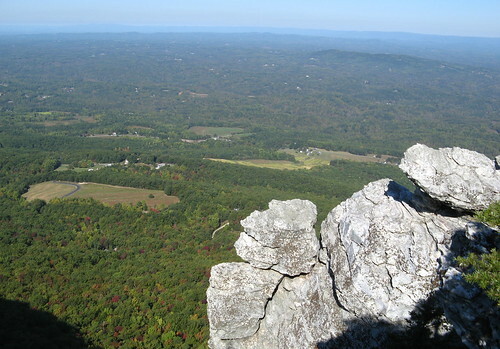 Hanging Rock has been there for a billion years, I suppose, but the park named in its honor is a more recent innovation, dating to 1936. A reunion and celebration of the park’s 75th birthday on Saturday spanned generations of people who built the park and readied it for recreation. 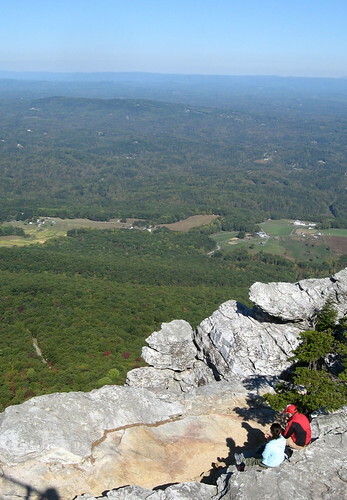 Last year more than a half-million people came to Hanging Rock. 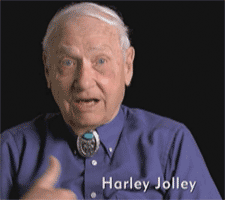 This morning I googled Dr. Jolley and found out he’s published a book on the CCC and appeared in a PBS “American Experience” episode devoted to the Civilian Conservation Corps. (Watch it here). He’s quite a remarkable guy: Pearl Harbor survivor, retired professor of American history, authority on the Blue Ridge Parkway — and deft performer. He knew when to be funny, when to be poignant. He worked the room without a microphone, nobody had any trouble hearing. 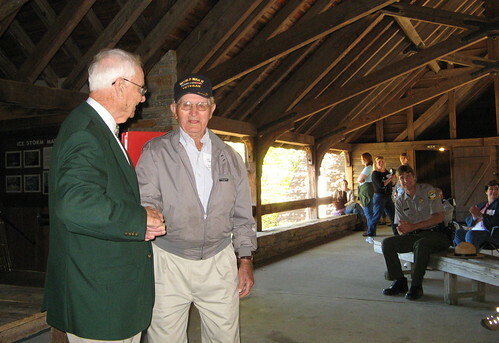 Professor Holley, left, with a guy who was posted at Hanging Rock State Park with the Civilian Conservation Corps. Didn’t get his name. I saw all this after I’d finished an excellent 5.5-mile hike to Moore’s Knob, where the view is always worth the climb if the weather cooperates. 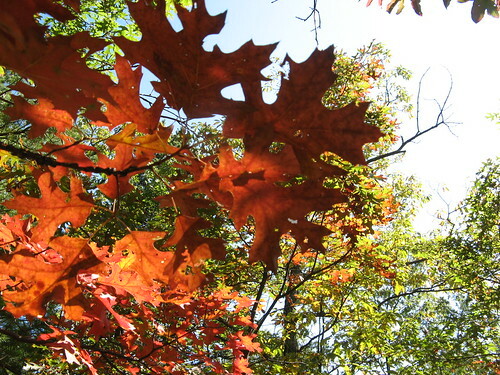 It was sunny and pleasant, ideal hiking weather, with splashes of fall color starting to light up the hills. Here’s how you can tell you’re at a great park: Every time you think it’s as good as it can get, it gets better. I’d done the Moore’s Knob hike at least a half-dozen times, but this time I took a detour around the park lake for some views I’d never seen before. 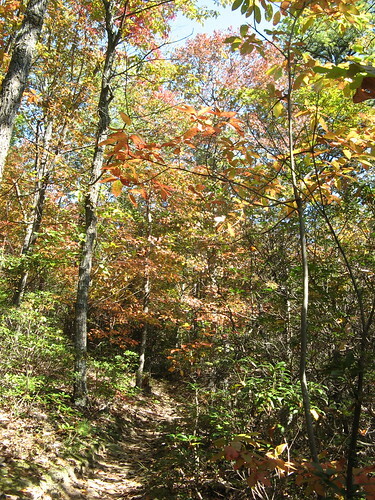 Then I strolled through the campground, soaking up the aroma of all those open-fire breakfasts, found the trail and huffed to the top of the Knob, marveling at the contrast between the greens, reds and yellows. Then I came back down, joined the Friends of Sauratown Mountains, and caught a history lesson from one of the people who lived through one of the most fascinating chapters in U.S. history. That’s within a percentage point or two of perfect. You really get a feel for the fall-color transition here — still lots of green, but plenty more colors coming in. 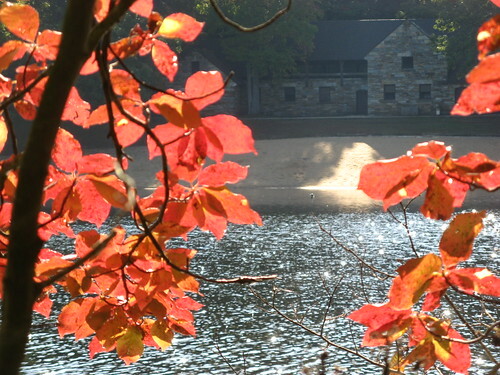 Here’s a look at the Bathhouse from across Hanging Rock Lake. This is the first time I’ve seen it from this perspective. These look like holly berries; can anybody help me out here? If you take the path around the lake, take note: you’ll eventually come out on the park road, which leads to a left-turn on the campground road. You follow the road till it ends — look for the “Trail” signs, first on your right, and then across the road on the left. 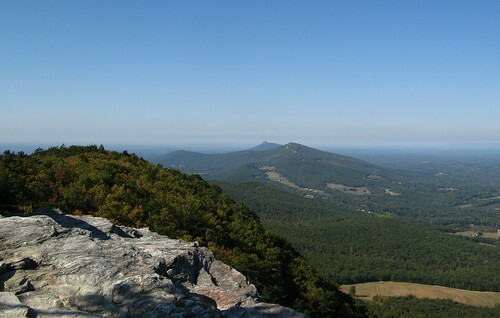 This counterclockwise route is the shorter, faster and steeper way to Moore’s Knob. The trail markings intuitively guide hikers on a clockwise route with a more gradual ascent to the top. In theory this makes sense, especially for beginning hikers, but in reality I find it just drags out a long climb that I’d prefer to get out of the way ASAP. On the other hand, it’s much harder to find your way on the counterclockwise route — it’s easy to miss the turn-off and confusing when you reach the campground. But if you’ve got your park map and feel adventurous, it’s worth checking out. The Sauratowns, a mountain range of our very own. OK, this shot is better with people in it. And from a distance. Standard advice for photography is there should be one object of focus in the image. Great thing about having your own blog: you can ignore standard advice when the urge hits. OK, that’ll do it for this week. 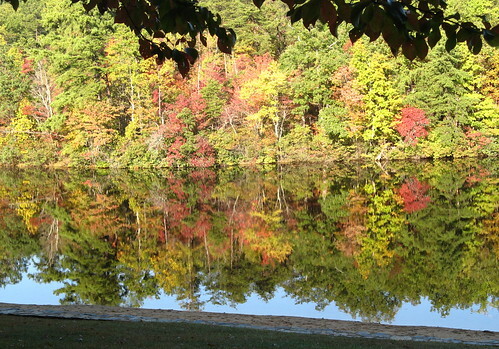 North Carolina State Parks page. “Civilian Conservation Corp” on The American Experience. Well, I don’t know how old the rocks are but it was only uplifted to where it could be hanging about 300 million years ago. I am guessing it hanging carear is much shorter than that. See, Tom, I subconsciously threw you a scrap there. Tom, the berries look like mountain ash to me. 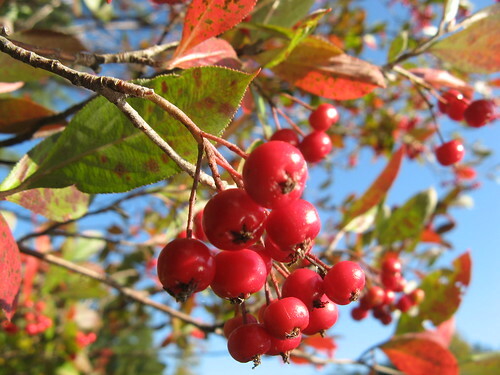 Those berries don’t look like mountain ash to me. Looks more like dogwood. Good call Jim. I think you’re right. Nice Hike and write-up Tom, I too prefer the “counter-clockwise” route to this destination. I can only imagine how beautiful it was up there this weekend with the colors and deep blue sky.